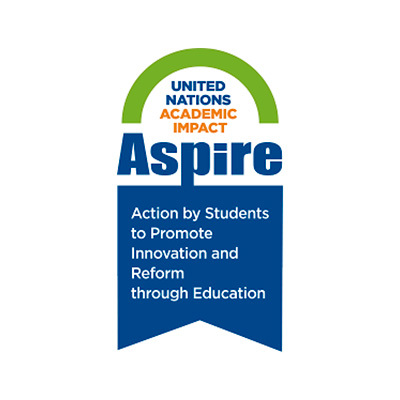 The student branch of the UN Academic Impact is known as ASPIRE: Action by Students to Promote Innovation and Reform through Education. ASPIRE is a student-driven initiative and actively embodies UNAI’s principles within student communities around the world. Operating locally within their communities, the activities of each ASPIRE group contributes to UNAI’s overall message of unity and action to address global challenges. ASPIRE personifies the saying, “Sharing a Culture of Intellectual Social Responsibility.” It connects student organizations and individuals to global opportunities through the United Nations, educational and academic institutions, and civil society groups that focus on the UNAI principles. ASPIRE prioritises above all else, activism and action by students to promote and support the ten universally accepted UNAI principles. Reinforce, suggest or initiate activities that actively support one or more of the ten UNAI principles. Participate in UNAI activities and initiatives, for example, the Classroom Conversation seminar series, and the “Unlearning Intolerance” discussion series. Participate in conferences organized by UNAI and UNAI member institutions. Contribute to the promotion of the ten UNAI principles via social media and UNAI platforms.